I have been using my HyperX Cloud 2 for several weeks now. However, a few days ago, the cable got stuck, bent and the tip of the 3.5mm TRRS headphone jack split in two. I have ordered a replacement 3.5mm TRRS jack, but haven't yet figured out the correct connections to solder on the jack. Could anyone offer help in finding these and possibly give some advice on the soldering? In an attempt to fix my HyperX Cloud 2 jack, I read lots of posts about how to repair a 4 pole jack. All the wiring diagrams corresponded to four wires being visible once I stripped the insulation. But to my surprise there were five wires when I stripped the insulation! As expected there was a red wire which is for the right channel green wire which is for the Left Channel a red and green wire which is the microphone and then there was an aqua and a copper wire each. I couldn't find any diagram that corresponded to the Hyperx Cloud 2 specifically so I just had to figure it out by looking at other diagrams and thinking through how the jack might be connected. Here is the wiring that I ended up doing and it has worked perfectly for mine. Tip aka pole 1: solder both the Aqua and the Copper colored wires. I believe these are called "common" which some people call "ground." 2nd section down, aka Pole 2: Red wire, which is the Right channel. Pole 4: Red and Green wire, which is the Mic. Would this also work on the cloud stinger? The cable has probably a fractured wire where it enters the jack plug. It is better to replace the plug and create a new connection. Since it is a gaming headset, I'm assuming it has a 4 pin (TRRS) jack plug. Here is a link to a video which shows how to connect the cable into the plug. As there are 2 standards as to how the wires are connected, (see image below) you may have to use an Ohmmeter to determine the correct connections. The best way to do this is to cut the cable at least 2 inches from the jack plug, strip off the sheath back to the jack plug to expose the wires, strip a bit of the insulation from each of the wires and then using the Ohmmeter, check between the jack plug connector and each wire to ascertain where it goes. Write down the colour of the wire and to which pin it is connected to, then you will know how to connect them into the new jack plug. You may find that there are two earth wires (possibly), 1 for the speakers and 1 for the microphone. Therefore they will both go on the appropriate earth pin for your connection type. If you want to prove which wire it is before you cut the cable, use the Ohmmeter and connect one lead from the Ohmmeter too the earth pin of the plug and the other to either the tip or the first ring connector of the plug (depending on whether it is the left or the right ear speaker which is the problem and see if the Ohmmeter reading changes when you flex the cable at the end of the plug. If will be a bit difficult as preferably you would like to have 3 hands to do everything but it can be done. if you hold the plug flat down on the table with the 2 meter probes in one hand (on the correct pins) get a reading on the meter and then gently twist the cable near the plug end with the other hand you can do it. Okay, my sons cat chewed the wires on his, I'm pasting the schematic for the wires I posted on Imgur. Note, the colored wires (red, green and copper with red are all coated with a non-conductive lacquer, this you easy burn off with a lighter just enough to make a connection again. If you have heat shrink to cover each wire great, if not electrical tape will work, just really bulky. Now the larger stranded copper wire isn't just what it looks like, there is a insulated white wire inside of this. 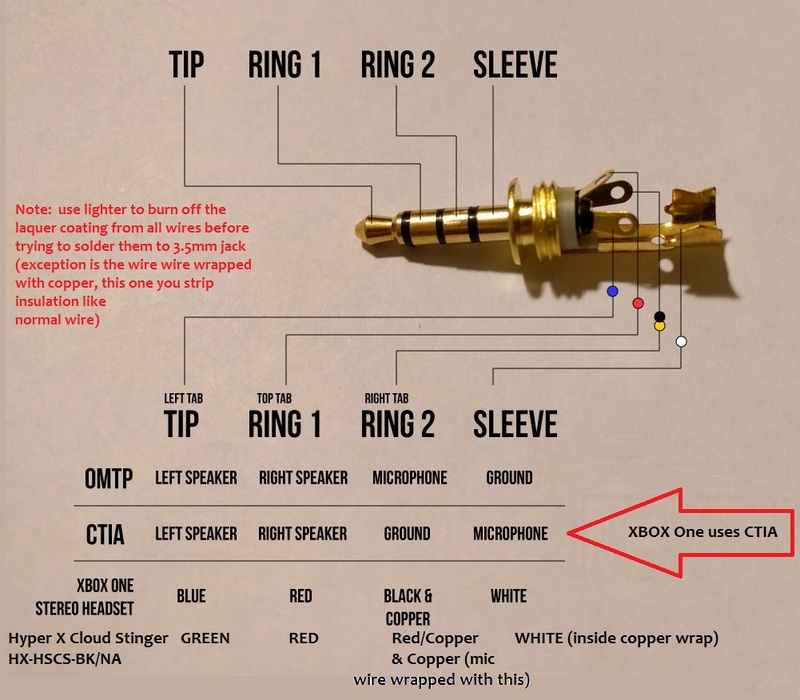 You must follow the CTIA wiring diagram for the 3.5mm jack for Xbox one. Besure to twist the red/copper wire with the plain copper wire (the one wrapped over the white wire), these are your ground wires, they get soldered to the RING 2. The Green wire is left speaker and solders to TIP. The Red wire is right speaker and solders to RING 1. The White wire (cut back a little bit the insulation) solders to SLEEVE. Hope all this helps. Hi Squatch, my nephew's HyperX headset are broken too. I bought a sennheiser 3.5 plug to fix them. The headset has the same 5 wires and colors than yours (red, green, coper/red, and a standed coper with white wire inside). This color scheme worked perfect for you? Do you think I can use it in these too? Thank you very much! Sorry for my english and regards from Monterrey, Mexico. My kids have a Hyper X Cloud Core (KHX-HSCC-BK) gaming headset they use on PS4. One too many pulls on the cord instead of the plug rendered the right ear and microphone dead. I knew the break was near the plug because you could wiggle the cable and get intermittent sound in the right ear. Knowing this, I bought a replacement 3.5mm TRRS plug (4-pole...Right, Left, Ground, Microphone) online to make the repair. I cut the main cable about an inch back from the plug. I found two inner multi-strand wires; a white and a black. Inside the white wire were 3 additional wires; Blue, Green, and Red/Green. Inside the black wire were 2 additional wires; Red and Copper. Therefore, a total of 5 different wires within the main cable...and 4 connection points on the TRRS plug. Blue (Left ear) to pole 1 (tip). Also, you will want to quickly burn the tips of the wires after you strip them and before you solder. They have a coating on them you need to burn off in order to make a good connection. This could be a little tricky if you are not familiar with this kind of thing, you don't want to damage these very thin wires. I then cleaned the wires from burning off the coating (black soot) with alcohol wipes. Soldering these small wires to the small connection points on the new jack was also tricky. (Probably not the best project for a first-timer learning how to solder.) You may find YouTube videos on this topic helpful, IE: Search "How to replace jack plug on gaming headset". I also used a piece of shrink tubing to make the cable and new plug connection a little tighter and hopefully stronger. We are now back in action and now that I have it sorted out, future repairs (if required) will go quickly. Bottom line: Gaming headsets cost too much to simply discard if the cable or plug is damaged. Since I already had the proper tools and solder, my cost was limited to my time and about $2 for the plug and shipping (The plug cost less than the shipping)...cheaper than buying the replacement plan. I hope you find this post helpful. PS - What they won't tell you are the electronic stores: If you ever need an inexpensive headphones w/mic (I keep one as a backup), go to the mobile phone section. They often have ear buds w/microphone that cost under $10. They work on PS4. Often, the gaming headphones start around $50 and go up from there. Most of the employees won't think of ear buds w/mic... or if they do know, they've been told not to mention that. Just make sure it has the 3.5mm TRRS male plug. hope this works it would be nice when ever the replacement comes in if you could help me. If not that is okay I should be able to figure it out by your exp in the post. Hi, I wanted to say thanks for the info. I fixed my HyperX Cloud Stinger wiring. The wires are slightly different colours. See image from JoshL for numbering of positions. Each wire needs to be stripped a little (about 3mm) by burning with a match or lighter and then lightly sanding outwards. If more has burnt, trim this off. See no.2 and no.4 where the red wires have been lightly burnt to uncover the copper. Tip aka pole 1: solder both the White and the Copper colored wires. I believe these are called "common" which some people call "ground." The white is inside the bare copper wire and needs to be stripped a little by burning with a match or lighter. Pole 4: Red and White (striped) wire, which is the Mic. Our wires are different again! Instead of your red wire - we have a blue wire! Does anyone have any photos of how the wires attach to the headphones at the other end to the jack? ie how do the wires solder onto each speaker and the mic connection? My son did a really good job of yanking them out....accidentally of course!!! I found that simply replacing the broken cable and soldering into the PCB on the left earpiece is WAY simpler. I thought my headphones were done for so I opened them up and realised that it's actually quite easy to repair. However, for now I have repaired it with only the audio, no microphone. But I will search for a cable with 5 wires to repair that as well! Thanks, worked for me! I was also able to get the mic working with a 4 wire 4 pole cable. I left a few inches of the two wires that were already soldered into the mic jack(not the main board) of the headphones and simply connected the old mic wire to the new cables mic wire and spliced the new ground wire to the old mic ground wire to create that elusive 5th wire. Back to gaming! This is what I’m struggling with getting that elusive 5th wire. Does it affect mic quality at all to blend the grounds like that? Or is it better to have separate ground all the way to the jack. Also, what cable did you use as a replacement for the hyperx one? A lot of the ctia 4 pole cables I’m finding on amazon have a reputation for dying within a month or so. I haven't experienced any degredation in sound quality but it may vary based on cable used, solder, soldering quality etc..
To be sure, I would run a continuity test on the cable you purchase. Oh, and test the new cable BEFORE you do all that work. I ended up buying a four pole female panel plug and replaced the wire entirely with that splicing the grounds where they terminate in the plug. Then I can use any male to male truss connector to go from the newly installed jack to the 7.1 USB device (or straight to a ps4/Xbox controller. Then if my cable has any trouble again I can swap it out easily. The cable I bought was from monoprice and only cost $2.50. The panel jack was only $2 and I got two of them for that price (though they did take a couple of weeks to arrive). All in I basically turned my broken cloud 2 headset into a cloud alpha for less than $5. I have the hyperX cloud ii and the jack broke in half. My wiring inside is completely different colours to what is above. red/white striped - soldered to pole 4. Edit - It works perfect on everything else ie phone/ipad/pc....but no mic on the xbox. Back to the drawing board. pole 4 - White ( the one that was wrapped inside the copper wiring. Hope this helps someone also with the hyperX cloud ii. I would like to know what the combination is, I could not find out, somebody, help me? hey, does someone know how to solder the wires properly, when the earphones are opened? i cant figure out where to solder the cables on. I have the HyperX Cloud two and thanks these post sould help me fix those. Although my HyperX Alphas just broke at the jack, right in the middle. So I broke it in half as it was crack all the way through, going to get a male piece and solder for my first time in years, wish me luck. Yhanks for these replys and diagrams! Just had to repair a similar headset of the same brand. Was it the hyperx cloud stinger? Arma Destek wird auf ewig dankbar sein.